Transitioning from the less structured days of summer to a school routine can be challenging. But there are many ways to ease into the first days of school. Getting off to a positive start can influence confidence, attitude and aptitude. Here are a dozen practical tips. 1. Start the school routine about one week before the first day of school. Beginning with the time to be out the door, work backward to establish with your children the times to go to bed, get up (set alarms), wash, dress and eat a healthy breakfast. Begin limiting TV and computer time a little more each day. Although your children may resist, routines will help them feel more comfortable when school starts. 2. Have a designated landing spot and permanent place for everything – backpacks, homework, school papers, sports equipment, a bin with snacks, shoes — and a system to keep track of everything. Review with your family where everything goes. Periodic praise is helpful when the system is followed. If anyone gets off track, use gentle reminders. Kids will learn to be organized and see how organization makes their lives so much easier. 3. First shop in your home for school supplies. Gather leftover items and cross them off the school supply list. Grab the list and take your kids shopping, let them pick out what they like (within reason) and allow them a couple of splurges. They’ll be more invested in the process and returning to school will be more fun. 4. Use two checklists. 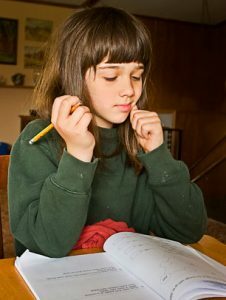 The evening checklist speeds up things for the next day (make lunch, sign papers and put them and homework in backpacks). The morning checklist is for immediate tasks (brush teeth, put lunch in backpacks). Free checklist apps are available. Encourage older children to do it themselves. 5. Use timers on your/their mobile phone so everyone is on time. 6. For younger children’s clothes, use a hanging sweater organizer to simplify getting dressed. On Sunday, put complete outfits with socks and underwear in each of five slots labeled Monday through Friday. The sixth slot can be doubled up for Saturday and Sunday or used for footwear. Let your children pick the outfits (again, within reason). 7. Have a family calendar in a central location. Using a separate color for each person makes it easier to see who is going where and when. Add events immediately so nothing is forgotten. On Sunday evening, review the week’s schedule. Each evening review the next day’s schedule. 8. If you pack lunch for your child, prepare an entire week’s worth at once, ideally on a Sunday evening. Divide fruit into five individual containers. Freeze peanut butter and jelly sandwiches and yogurt. Grab what you need each morning. Easy! 9. Instead of keeping every school paper and piece of artwork, save the most special ones and take photos of the rest. Nothing is special if you think everything is special. 10. Use a school days memory book with pockets to save special awards, activities and achievements in one place. They may even come in handy later when filling out college applications. 11. Have a charging station for everyone’s cell phones. Put the phones there before bedtime so you know your kids are not texting late into the night. 12. Most importantly, be positive and upbeat! Remind your kids of past fun experiences like a class trip or project, and seeing old school friends and making new ones. As a parent, it’s important to set a good example by being organized yourself. (If you and/or your spouse are not, a professional organizer can teach you (and your children, if you like) proper organizing skills and principles and how to apply them to your specific situation.) Children tend to pattern what they see. The younger your children are when they learn proper organizing habits and skills, the better they will do throughout their lives. The skills are transferable in many ways. However, it’s never too late for anyone to learn. 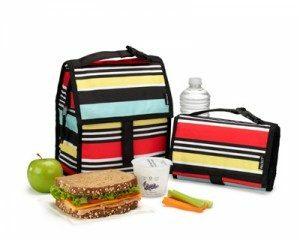 The PackIt insulated lunch bag keeps food cold — PackIt claims for up to 10 hours — due to its built-in gel-lined walls that freeze. It folds flat for storage in the freezer (the photo shows it both open and folded). Toss in a sandwich, fruit and drink and zip it closed. It comes in lots of colors and designs. Other options include mini-cooler, shoulder bag and carry-all. PackIt products are available at bedbathandbeyond.com. The lunch bag sells for $19.99. I have the lunch bag and love it! My only improvement would be to include an outside pocket or two for napkins and utensils. Some of my colleagues in the Greater Philadelphia Chapter of the National Association of Professional Organizers contributed tips.